Congratulations to the winner of the ACTA Member Satisfaction Survey! Networking Reception, Dine and Discover with ACTA in Saskatoon! The Canon Ambassador Program is your online portal to exclusive, preferred pricing on Canon consumer products. Your exclusive access includes free shipping on all orders over $49.99 and access to new products! September 13: Networking Reception, Dine and Discover with ACTA in Saskatoon! Quebec’s Office de la protection du consommateur has provided ACTA, explanations of the new Regulations to the Travel Agents Act in Quebec that came into effect on August 1, 2018. ACTA has been an active contributor in the drafting of the proposed regulations through our participation in an OPC Advisory Committee. The Taiwan Tourism Bureau and the Association of Canadian Travel Agencies (ACTA) have entered into a Corporate Partnership Agreement to bring Taiwan’s history, culture, attractions and beauties to ACTA members. As ACTA's new Director of Education and Certification, Maggie Santos, is committed to providing you with beneficial education, training and professional development resources, tools and learning content in education and certification. SAVE up to 40% on Canada Post! This benefit provides a discount of up to 40% off the retail price of Priority and Xpresspost Prepaid Envelopes. Pricing is based on volume of orders and through your orders, we will be able to continue offering you the same great price and possibly even a better discount, over time. ACTA would like to invite you to take a listen to our webinar on August 15, 2018 with Peggy McNeil, Strategic Key Accounts Manager of Seabourn. As you learn how to bring new-to-cruisers to the extraordinary world of ultra-luxury small-ship cruising, Seabourn Style! Please note: to view the webinar, you will need to sign into our Member's Only Section. Book your clients at The Langham Huntington, Pasadena and earn up to $200 USD per reservation. In addition to the cash incentive, receive a complimentary 2-night stay when you book over five reservations. 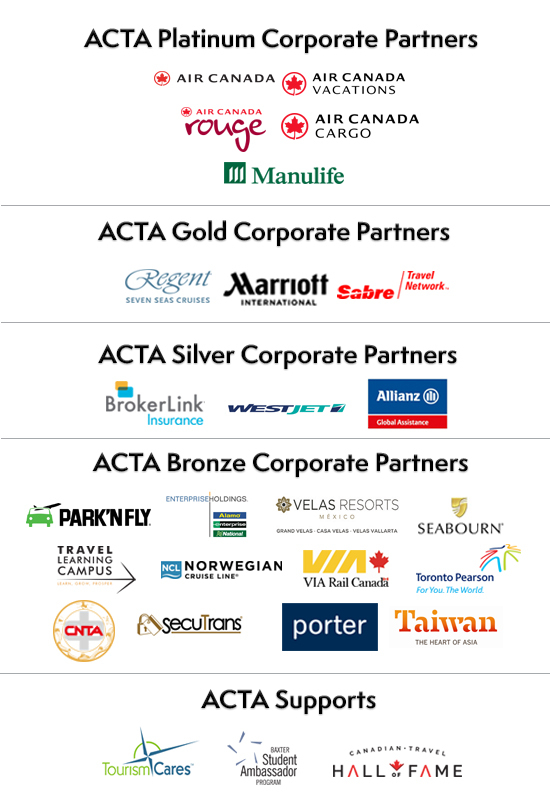 Thank you to ACTA's Corporate Partners for all of their support!